"IT'S A GAME I'LL ALWAYS REMEMBER"
Many of the prospects that walked into the gates of Ohio Stadium Saturday were being recruited by both Ohio State and Michigan. That's true in the case of Oscar A. Carlson (Rockwood, Mich.) wide receiver Ian Stewart. Stewart, a three-star wideout in the class of 2020, was making his second visit to Ohio State. The Buckeyes extended an offer on Sept. 25, after the Wolverines had done so this past summer, on June 18. "The atmosphere was crazy. It’s a game I’ll always remember," Stewart told Eleven Warriors. We know how the game ended and while that could've had a small effect in Stewart's decision, the truth is that Saturday's outcome was one game. Stewart is looking for lifelong connections he can develop before making his college decision. "I’ve built a pretty good relationship with coach [Larry] Johnson and I'm also talking with coach [Brian] Hartline ... trying to connect there," he said. "The atmosphere and the rivalry, to be a part of something like that would be special." Stewart is ranked as Michigan's ninth-best overall prospect in his class and as the nation's 69th-best receiver. At 6-foot-3, 200 pounds, he has Big Ten offers from not only Michigan and Ohio State but also Michigan State, Indiana, Purdue as well as a host of others from schools across the the midwest and east coast. The Buckeyes were already on Stewart's radar. But Saturday's visit made them stick out that much more. "It was my second [visit] and this one was better," he said. "The first time was great but just the intensity of the game made this visit electric." 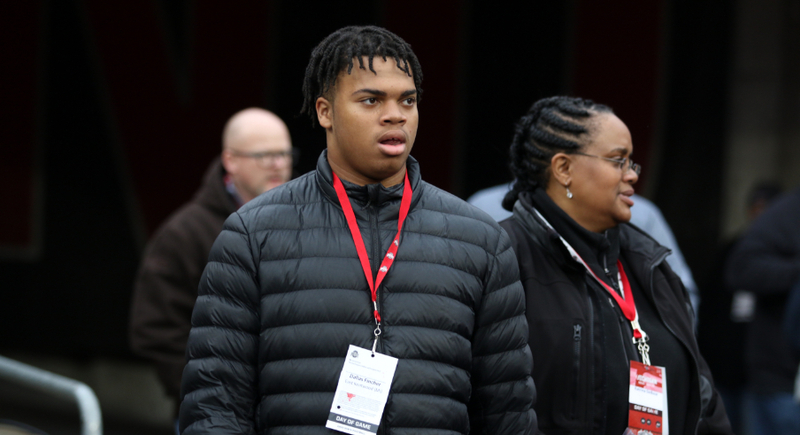 Similar to Stewart, East Kentwood (Grand Rapids, Mich.) guard Dallas Fincher attended Saturday's game, making the trip south to Columbus ... and it wasn't his first. And like Stewart, both Ohio State and Michigan are recruiting the 2020 three-star talent. The Buckeyes offered Fincher on July 27, after the Wolverines had done so on May 17. When asked about the biggest takeaway he had from Saturday's game, Fincher said "Ohio State is a great all-around school, academically and football wise, that I would love to play for." That's pretty straight to the point and good news if you're on the Buckeyes' staff. Offensive line coach Greg Studrawa would fit into that category. He's met Fincher before but Saturday, he met the most important people in the young man's life. "I really enjoyed talking with coach Stud because I hadn't seen him in awhile," Fincher said. "I was also able to introduce my parents to him." Fincher has over 20 offers from schools across the country including Wisconsin, Pittsburgh, Iowa and Kentucky. But one thing is for sure: at any of those others schools, he's not going to find an atmosphere to play in like Saturday's. "I really can't [compare visits] because I hadn't seen a rivalry game of this size in person," he said. "The atmosphere was incredible. I was expecting as such due to the size and importance of this game." 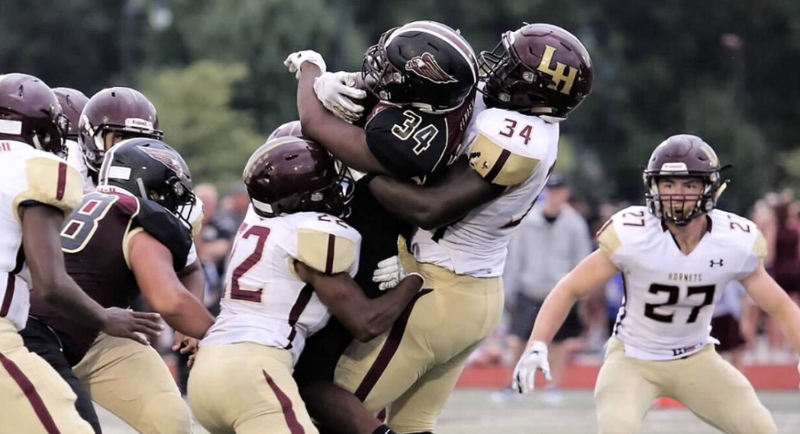 Ohio State has offered both Stewart and Fincher, however the Buckeyes have yet to take a look at in-state talent Paapa Yeboah, a tight end and defensive tackle at Licking Heights. Yeboah, a class of 2020 prospect, has yet to receive an offer at the next level but has plenty of interests from surrounding schools. "I have no offers at the moment but great interest from Michigan, Ohio, Kentucky, Wake Forest, Kent State, Youngstown State and Toledo," Yeboah said. So far he's visited three of those programs and has one that stands out above the rest. Licking Heights' Paapa Yeboah (34) is gaining interest from several Division I programs. "I’ve visited Michigan, Kent State, and Ohio University. My favorite has to be Michigan because of the love they show me and it feels like an amazing environment," he said. Translation: Ohio State may want to look Yeboah's way soon. "Haven't talked any to Ohio State," Yeboah said. "Would love to take a trip there and, hopefully, they check my film and see my size. I have a lot of heart for this game." Yeboah is listed at 6-foot-2, 245 pounds ... and runs like a deer. He's a problem for opposing linemen, stops the run well and is a great blocker at the tight end position. "I feel like a bring a dominance of some sort to the field," he said. "Like, my mentality is just different so if you’re lined up against me, I’m going to outwork you all game or all camp." Licking Heights finished at 6-4 overall this past season with all four losses coming to playoff-bound teams. Those four teams' record was an overall 43-9. Still, as his mindset might suggest, Yeboah is looking for more out of himself and his teammates come next fall. "Our team did pretty well this year," he said. "I have high expectations for us. I think we should make the playoffs and make a run in the Division II state playoffs."